4.4.2019 by Inge in Copenhagen, Dedicated to Patricia and Teddybärenmutti who celebrate their birthdays today. The little one is playing a lot and even annoying her mother. She’s a sweet and curious baby girl. On the 28th of March it was time for Lynn’s little princess to have her first swimming lession. Polar bears are excellent swimmers and even this cubbie was a quick learner. Lynn’s baby is a GIRL! Today the keepers and the vets had a chance to check the gender of Lynn’s baby and they found out the sweetie is a girl. They could even state that the ice princess is a healthy and mobile cubbie. Lynn’s baby is growing rapidly. The keepers estimate that the cubbie now weighs about 10 kilos. That’s 20 times the weight when the baby was born on the 1st of December! Our little polar bear cub is very curious and examines the enclosure with great energy and enthusiasm. We have emptied the pool in the enclosure from water and instead filled it with straw. Lynn and her cubbie can now be seen in the old polar bear enclosure in the zoo daily. Of course, it’s mama Lynn who decides if they want to be out or stay indoors. Soon it’s time for Lynn to present her sweet baby to the media and to the visitors in the Copenhagen Zoo. Lynn and her baby are happily unaware of the ‘hullabaloo’. 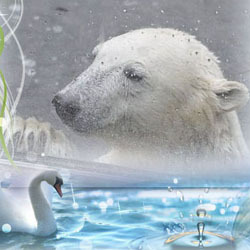 The polar bear cub in Copenhagen will soon come out! Lynn’s baby is now big and strong enough to be able to spend some time in the outer enclosure. The ‘premiere’ will take place on the 28th of February at 11.00 o’clock. The webcam – the Zoo-TV – in Copenhagen is working better. The screen is much sharper now so we can see Lynn and her baby more clearly. Log in | 49 queries. 0.854 seconds.